Warm ocean temperatures could be responsible for making this one of the worst years ever in coral bleaching. 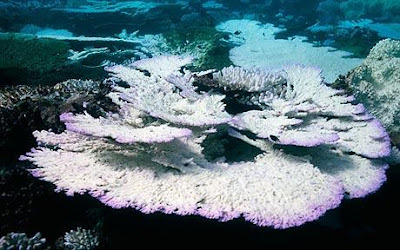 "The phenomenon, known as coral bleaching because the reefs turn bone white when the colourful algae that give the coral its colour and food is lost, has been reported throughout south east Asia, the Indian Ocean and the Pacific. Coral reefs provide refuge and food to nearly a quarter of all marine species, making them among the most biologically diverse habitats on the planet. Bleaching can also rob fish and other species of important shelter and food sources."